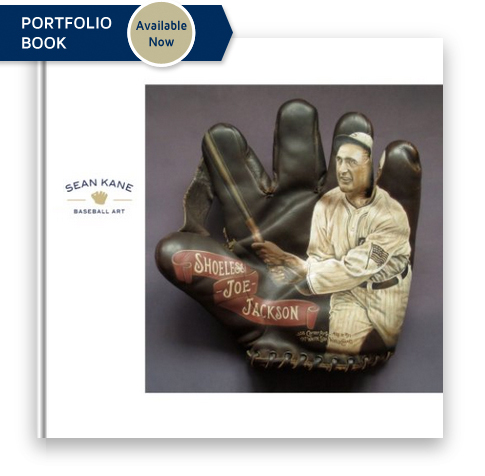 This hand-painted baseball glove features Jackie Robinson and highlights his rookie year of 1947 when he broke baseball's color barrier. During his debut in 1947, becoming the first African American in the 20th century to play major league baseball, Jackie Robinson hit .297 and led the National League with 29 stolen bases. The Brooklyn Dodgers won the National League pennant that year and Robinson was awarded Rookie of the Year. 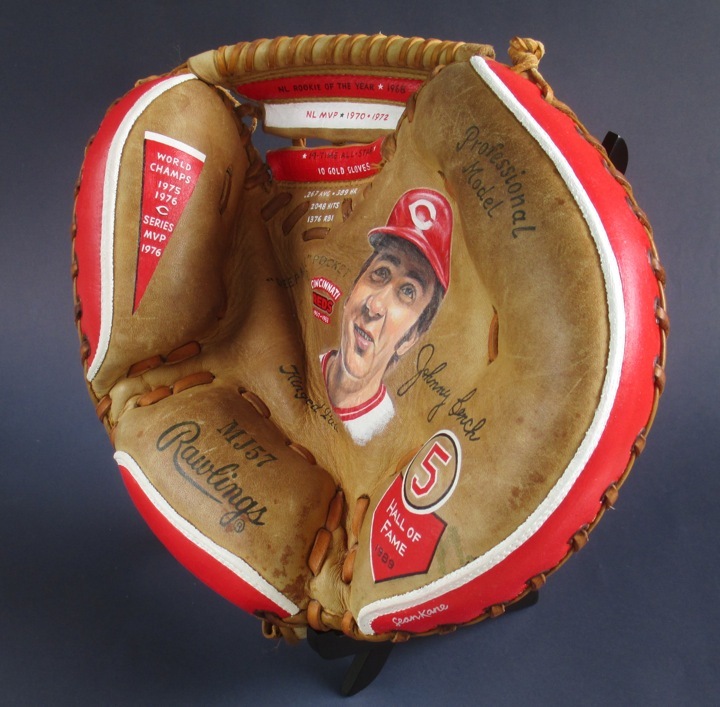 The vintage glove used for this artwork is a 1940's Spalding model MO. 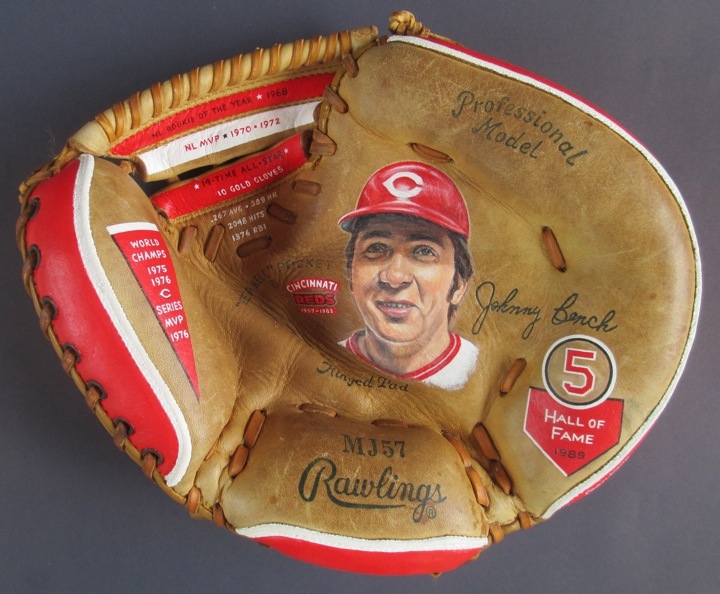 This glove is about 11 inches wide by 9.5 inches tall. 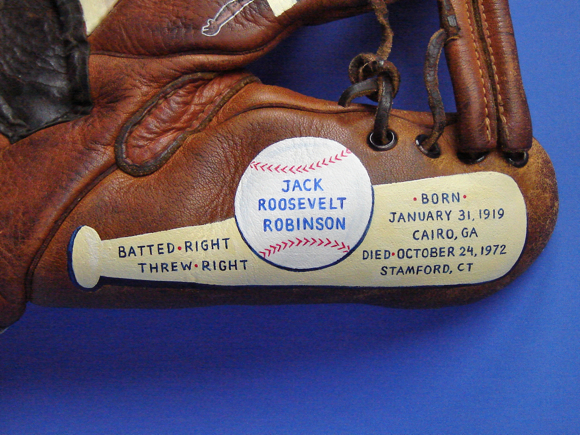 The front side features a hand-painted portrait of Jackie Robinson. 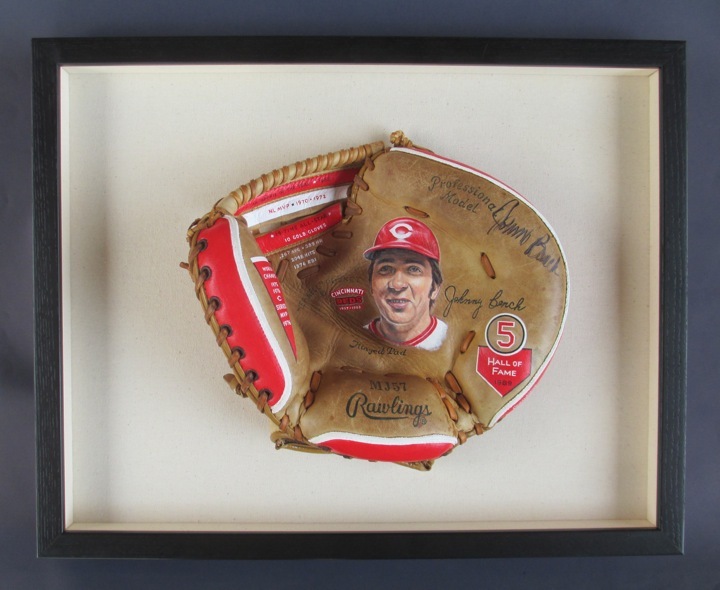 The portrait is a bit bigger than the size of a baseball, painted with professional artist-grade acrylic paint. 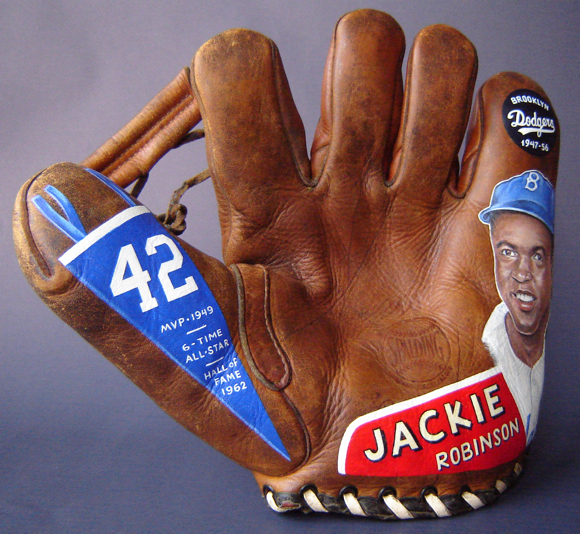 The front also references Jackie's famous number 42 and career highlights, including the 1949 NL MVP and his election to the Hall of Fame in 1962. 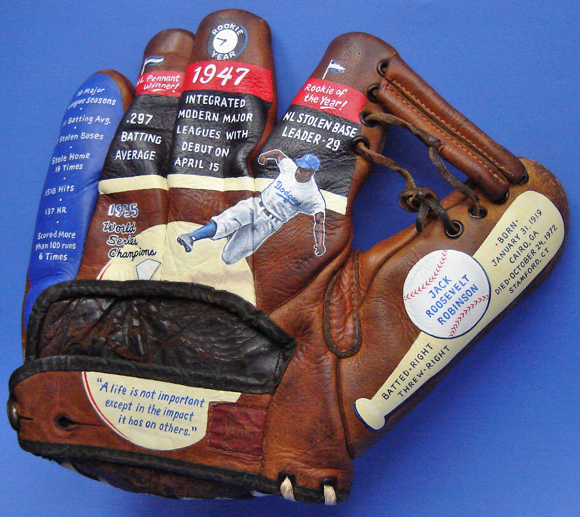 The back side of the glove includes a painting of a sliding Jackie Robinson. The backdrop to this image is a nod to the scoreboard at Ebbets Field, the famed home stadium of the Brooklyn Dodgers. A peek at what the Ebbets Field scoreboard looked like is here (opens in a new page). 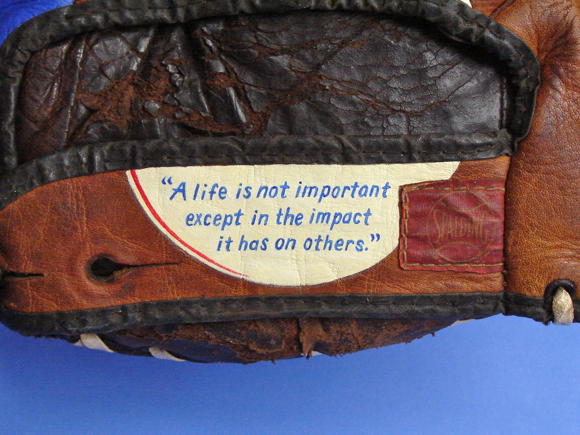 The back also includes career stats and personal info and a quote attributed to Jackie Robinson. Plus a nice Spalding label on the glove strap. Detail of Jackie Robinson portrait.